(SNN) If you don’t agree that levitating a frog and ways to keep your shower curtain from attacking you deserve an award, then read no further. 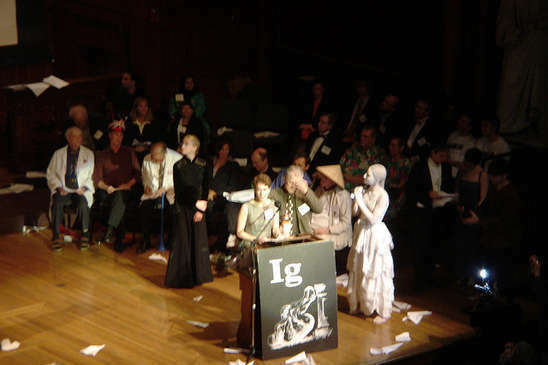 The award is the Ig Nobel Prize (pronounced Ig No-bell, and a play on the word “ignoble”) given to findings in science that first make you laugh, and then make you think. Brought to you by the folks behind the Annals of Improbable Research, the awards have been held annually since 1991. It’s all about recognizing the f’d up earlier stage that comes before the breakthrough – and the sometimes odd, funny and absurd results. After the ceremony at Harvard University, the ten winning science projects are then taken on tour to other countries. Here is an example from 2015’s gaggle of winners: While experimenting with micro fluidity on strands of protein, a scientist has an idea to see if it would be possible to unboil an egg and, removing the shell, he is ultimately successful. On Day 2 of the awards come the winners’ presentations: Using a hammer, the scientist drolly demonstrates how to distinguish the baggie with the boiled egg from the egg that has been unboiled. He then describes how this technological advance for converting solids into liquids is being used for experiments in renewable energy. First you laugh, and then you think. Image: Some Rights Reserved. Photo from Jeff Dlouhy's flickr photostream. Original image can be found here.